This quote was taken from a journal detailing the death of an unknown man who committed suicide by starvation in the Austrian Wetlands. The story of this man’s demise really affected me both because of the lingering questions surrounding the insignificance of his life, and the idea that someone’s death can somehow justify their life. I found myself wondering why no one was looking for him and realized that through my questions about his life, I was also contemplating my own: how I live and what I consider significant. 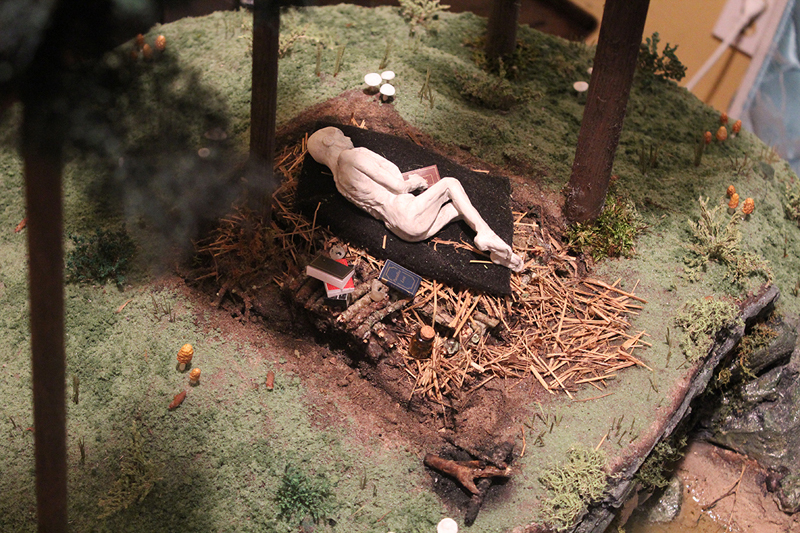 For my thesis work, I recreated a realistic miniature environment of the place where this man chose to end his life. I worked with a wide variety of materials including foam, wood, paint, clay, dirt, and assorted foliage along with incorporating several elements of sound to create an immersive environment that retells his story. Part of what I want to do in making this work is to provide a context in which there can be a resolve. Insignificance can only be reversed if his story is told and the emotional response missing from his life is achieved by the re-discovery of his death.